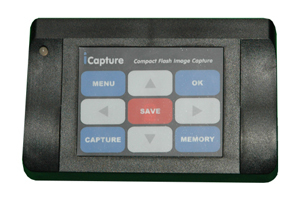 The Video Capture Module provides the ability to capture S-video from live sources onto Compact Flash (CF) media. The CF card can be read at a later time on a remote PC using the supplied USB card reader module. This is excellent for production environments where occasionally images may need to be archived and a PC is not available.